Well, I know this book was meant for young adults, but I could not put it down. Elizabeth Farrelly, architect and writer, structured this novel with well-placed scaffolding. Step by step she builds suspense with increasing anticipation, and leads you to a fast-pace and enthralling climax, with a little bit of wisdom along the way. From the moment the lead character, 12-year-old Caro, and her hapless ragtag crew wag school and take off on their adventure to Goat Island, you’re in the hands of a master craftsman. Five young people, each escaping their own demons, miss their ferry home, have to spend a night what at first seems to be a deserted island and then uncover dangerous criminals and a treasure chest full of dollar bills. As the five, (one cannot help think of The Famous Five) grapple with the ruggedness of the island and its dangerous inhabitants, they learn to respect and love each other. They change from being a sparring, competitive collection of individuals to a caring and open group of young people, each helping the other deal with their own baggage. Ellen has to deal with the parental neglect that comes with her wealthy background. Caro has to deal with her feelings of guilt at causing the death of her older brother. Little Neddie has to prove that, small as he is, he is not little, but courageous and loyal, and Nigel the odd-bod who is always teased at school, proves himself to be smart, fun-loving and warm. The children open up to each other and help each other grow and overcome their insecurities while having an adventure of a lifetime. We even see a change in one of the criminals, Jamie Savage, who changes from being a stutterer to a man of courage who can finally stand up to his younger and more aggressive brother. 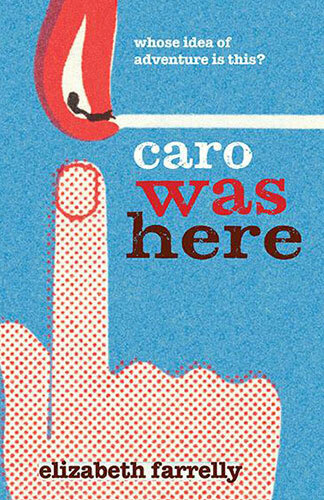 Farrelly is a masterful storyteller and Caro Was Here is the sort of book that brings up many issues young people grapple with in their quest for identity. It’s not only a good book to give a young person, but a good one to share and discuss with them.